Please Note: Work may be adjusted depending on weather and other conditions. During extreme cold and winter weather, construction activities will likely be canceled or delayed. Additional projects may be added to this list. 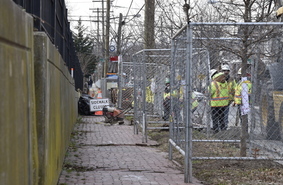 DDOT contacts residents and businesses within the work zones before work begins. Unless otherwise noted, work is not conducted on weekends. As part of DDOT's commitment to the improvement and restoration of local sidewalks, construction activities will occur at the following locations throughout the next two weeks. DDOT will improve alleys at the following locations. 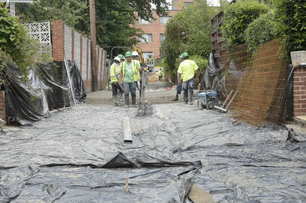 Once work begins, access to parts of the alley under construction will be closed, and parking will not be available. In emergency situations, access may be permitted by notifying DDOT. Work is estimated to take about two weeks, weather permitting. Striping season is underway, weather permitting. Pavement markings indicate which part of the road to use, provide information about conditions ahead, and, overall, are a vital part of communicating the traffic movement. Optimal striping weather is warm and sunny (45 degrees and above with low humidity). Cooler temperatures prevent successful paint application. 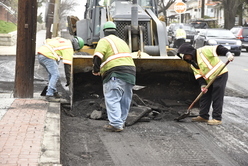 During colder weather, DDOT installs temporary roadway marking tape, as needed. If you live in, or near any of the project areas, please remove your vehicles by the posted times, and encourage your neighbors to do the same. Please follow @DDOTDC on Twitter to see regular updates and notices. For a more detailed look at DDOT’s Paving Plan click here. Visit DDOT’s blog, d.delivers. For the DDOT Pavement Data Map, visit here. 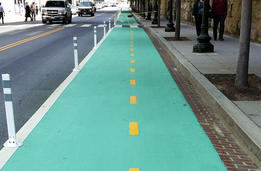 For more information about DDOT's alley improvements, click here. For media inquiries, please call (202) 671-5124. For constituent inquiries, call (202) 671-2700. If you're an Advisory Neighborhood Commissioner, please call the Community Engagement Manager Lee Goodall at (202) 671-2288 or email [email protected]. To sign up for DDOT's releases, visit here.